The sea along the west coast is very dangerous when storms driven by the north east winds occur. Certain parts of the coastline are more dangerous than others and in most of the really dangerous areas you will find a lighthouse guarding the coastline. 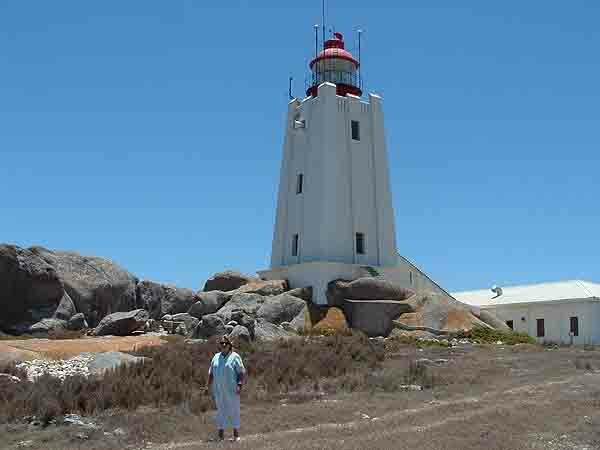 In between Cape Town and Shelley Point a distance of about a hundred and fifty kilometres you will find no fewer than eight lighthouses situated at various points along the coastline. Shelley Point is the most northerly lighthouse and fortunately does not have a history of shipwrecks on its doorstep. That is not to say that ships have not run aground in the area, I just could not find any evidence. Cape Columbine near Paternoster just a few kilometres south of Shelley Point however is a known burial ground of a number of ships most of them wrecked before the lighthouse was built on Castle Rock, a massive granite outcrop found a few hundred metres inland from the sea. The first ship to run aground there was the troopship SS Saint Lawrence which did so in 1876. Fortunately no lives were lost when the 2nd Battalion of the 3rd Buffs were forced to abandon ship on the rocky coastline. In October 1910 the SS Lisboa, a Portuguese twin screw steamship which was en route from Angola to Cape Town also ran aground on Soldiers Reef near Paternoster. On board were 250 passengers and 50 crew as well as a number of bulls and a cargo of olive oil and wine. When the Lisboa ran aground many of the barrels of wine were washed overboard and smashed on the rocks apparently turning the water in the sea around the ship red. A number of these barrels were washed ashore and before customs officials could lay claim to them they were buried in the sand by locals to be dug up after the customs officials had left the area. Finally in 1936 after three more ships the SS Haddon Hall in 1913, SS Malmesbury in 1930, and the SS Haleric in 1932 had run aground the authorities came to their senses and the Cape Columbine lighthouse was erected. 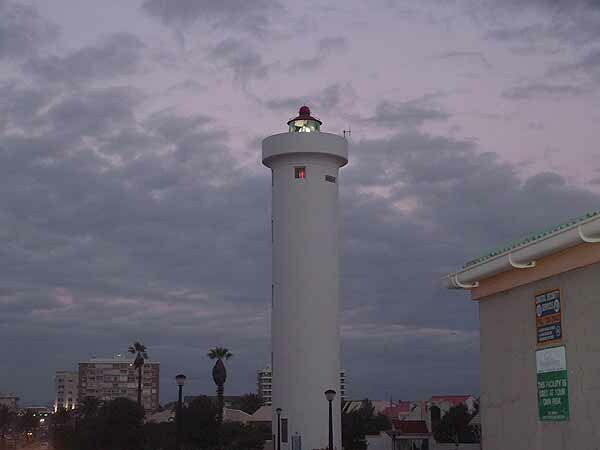 It is still standing today and is one of the first lighthouses along the South African coastline to receive three navigational safety devices, namely a foghorn, a radio beacon and a lens designed for use with incandescent lightbulbs. Moving southwards the next two lighthouses found along the coastline are at the entrance to Saldanha Bay and are known as the North Head Light and the South Head light. 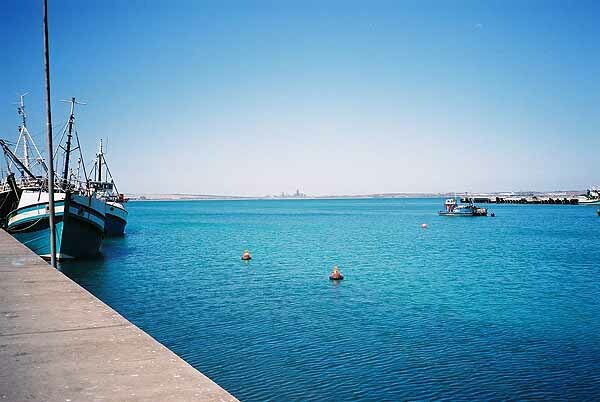 Saldanha Bay is no stranger to shipwrecks and a number of ships lie in the sands at the bottom of the bay. One of the earlier shipwrecks was the loss of the Nagel on the 27th May 1709. The ship was anchored in the bay just off the Saldanha Buitepost or outpost as it was known in the early days of the Cape. At the time the accident the captain and four of his crewmen were ashore fixing their fishing nets in their tent on the beach. As night fell the first officer and the "meester" who were still on board ship lit a lamp in the main cabin in the stern of the ship and then returned to their quarters near the bow leaving the lantern unattended. Somehow the lantern must have fallen over and soon the whole ship was ablaze. The captain on shore seeing the blaze rowed out to his ship to try and put out the fire but arrived too late and the only option he had was to scuttle the ship. The two crew men who had been on board made it safely to shore and were despatched to Cape Town to report the loss of the ship to the governor. When he heard their news he immediately clapped them in irons and held them responsible for the loss of the ship. The other crew members who stayed over in Saldanha Bay were ordered to salvage everything usable on the ship. Continuing southwards towards Cape Town we come across the next lighthouse along the coast which is situated on Dassen Island and was commissioned in 1893. It is one of the loneliest lighthouses along the coastline and today it is manned by a solitary lightkeeper who is visited once every six weeks when supplies are delivered to the island. The island being close to shipping lanes has over the years had its fair share of ships foundering on its rocky shores. Two of the wrecks lying off its coast are still visited by divers today as they make excellent dive sites. They are the RMS Windsor and the MV Southern Author. Between Dassen Island and the Robben Island is a very rocky coastline. At a place called Ganzekraal on the coast contractors were busy moving a sand dune to make way for construction of a number of houses when they came a cross two bodies buried together in the sand. They were wrapped in a burial shroud and had been mummified by the sand. Their clothing was also still intact. As they were in unmarked graves the authorities needed to find out who these bodies were. The boots the men were wearing and the buttons on the clothing provided some clues and eventually led to the discovery of a long forgotten wreck being rediscovered off the coast. After reports in the newspapers of the bodies being found a local farmer passed on information that a ship "The British Peer "had been wrecked off the coast in 1896. The date of the sinking and the evidence found on the bodies matched up and so it has been assumed that the two men were from the British Peer. After an investigation by the SA Museums archaelogical division the two bodies were returned to the area and buried on a farm nearby. 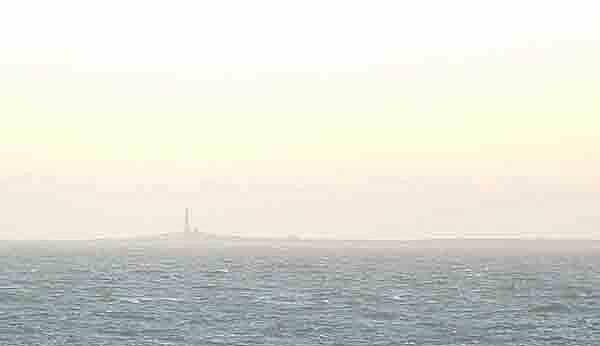 Even closer to Cape Town the next lighthouse we come across is the one on Robben Island. It is one of the oldest on the coastline and was established by van Riebeeck way back in the 1650's when he hung a burning pitch ring on a pole each evening to warn approaching ships of the dangers of the island. Unfortunately this early attempt at warning ships did not always have the desired effect and many ships came to grief on the rocky shores of the island. One of the early shipwrecks was that of the "Cape Packet" ship the Dageraad which ran aground in January 1694. The Dageraad was returning to Cape Town from St Helena Bay where it had been assisting with the salvage of the ship the Gouden Buis which had run aground near the mouth of the Berg River after most of its 190 crew members had died from scurvy. One of only two survivors from the Gouden Buys was on board the Dageraad when it ran aground on Robben Island and managed to swim ashore when the ship foundered with the loss of 16 lives. This interesting wreck which had a number of chests filled with coins on board at the time of its sinking still lies on the seabed within the prison security area of Robben Island. To date no legal diving on the wreck has been allowed so it is possible that a fortune is waiting on the seabed to be salvaged. Milnerton lighthouse on the eastern shores of Table bay is the last lighthouse between Cape Town and Shelley Point we will be visiting today. Built on a strip of land between the Milnerton lagoon and the sea called "The Island " it looks out over Table Bay and Table Mountain and across the most treacherous stretch of coastline in South Africa. Since the arrival of European explorers to the South African coastline in the late 1400's more than 150 ships have succumbed to the sea on this very innocent looking stretch of beach. Many of the wrecks are still buried in the sand along the seashore. Proof of the wrecks was found when the Sealand Express which ran aground a short way from the Milnerton Lighthouse was refloated. On inspection in the Cape Town harbour bits and pieces of old cast iron cannon balls were found lodged in her hull. Unfortunately many of the wrecks in Table Bay have been lost forever as land has been reclaimed from the sea and is now covered in concrete For many years lighthouses around our coastlines were manned but with the improvement of technology they have been automated. The result being that the houses once utilised by lighthouse personnel are now standing empty. The authorities to recover some of the costs of maintaining the properties have opened up eight lighthouses to tourism and have converted the empty houses into self catering units for use by the public. To improve the experience of visitors to the lighthouses tour guides have been trained to show people around. Our lighthouses are interesting places to visit and the lightkeepers have some interesting stories to tell. Why not visit some of them and find out for yourself. Contact "Salato" The South African Lighthouse Adventure Tourism Organisation for more information.